TEKS FIRST GRADE: Alphabet Adventure. Get ready to blast off. Big cheerful illustrations introduce students to the capital and lowercase letters of the alphabet. Have fun coloring letters and see them used in a word. The word is highlighed with a coloring picture so the students can better understand letter to word relationships. Perfect for anybody begining to learn english! Use this coloring book to further the students understanding of how letters are used to make words. 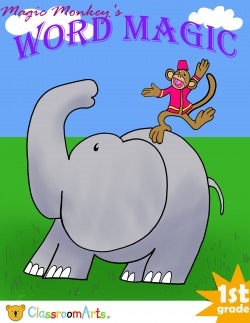 Join Magic Monkey as he grabs letters from the alphabet and puts them together to make words. Watch in amazement as trinket animals dance to life once the letters are formed as words. 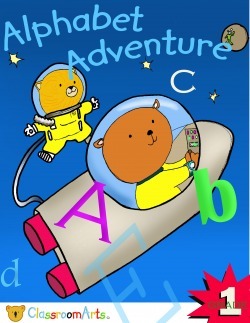 Jump in wonder at Monkey's crazy alphabetic antics! You and your students are going to have a really good time so get your crayons ready!